Perhaps that’s why they flock to small specialty shops in droves each December. Expat Marketing talks to Jason Kelly, who owns and operates Kelly’s Expat Shopping with his Dutch wife, Kelly (yes, that makes her Kelly Kelly). Jason explains why “the personal touch” is so appealing this time of year. Jason, how does business during the holidays compare to the rest of the year? We’re very busy. From Thanksgiving to New Year’s it’s usually non-stop. I would say it’s usually about 25% more than the rest of the year. What do you sell the most of come Christmas time? Turkeys is the main thing. But also anything that goes with Christmas dinner. Stuffing—Brits prefer Paxo and Americans Stovetop–gravies, cranberry sauces. We also sell chocolate assortments and tins which are quite popular. 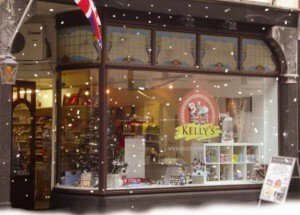 What’s the appeal of specialty expat shops like yours come Christmas time? People want to recreate their memories of the holiday at home with the people around them. It’s the same for us really, we do that with my parents. How has the draw of the small shop remained so strong, even with online shopping so convenient? We actually find a lot of people prefer to come into the store, especially at this time of year. There’s just something about being in a physical store. Expats like to browse and they don’t get that same experience online. One of the things we also try and do is provide personal service you wouldn’t get elsewhere. For example if someone needs a plumber or a nanny, we can recommend that to them right there. We keep lists for that purpose. Are the majority of your customers living locally then? We actually have people come from all over Holland, at the moment we’ve got an order ready to go for someone in Nijmegen. We do ship items by post though. We have business in Spain, Italy and the Canary islands, though it’s comparatively small. Do you bring the local touch to your advertising as well? This time of year we go out to the churches and Christmas markets in person. We’ll speak to people and hand out fliers. There are several small expat newspapers in Holland and we also place ads in those. But now we are also advertising on the internet through Google. In terms of generating business are the local efforts or the online campaigns doing more for you? It’s got to be the internet. It’s nice if all the mothers from the British school are talking about you but you also need to extend your reach beyond that. Again, we are getting customers from all over Holland and even abroad. That combination of online advertising and word of mouth has really helped us keep sales up, despite the economic situation in Europe. How do you see the future of the expat shop? I think it’s still very bright. I don’t think people will ever get to the point where they don’t want to go out and buy from a store. Posted in Expat Campaigns.Tagged expat Christmas, expat Christmas shopping, expat holiday food, expat shopping, Kelly's Expat Shopping.